Flower made using a recipe for gum paste. Making a gum paste recipe is something decorators who want to create stunning flowers and other figures are likely to attempt at some point. Though you can purchase premade gum paste that only requires tinting and kneading, it is helpful to have made the confection once or twice to understand how to work with it. Gum paste is similar to fondant in many ways. It is a pliable sugar dough that you can roll, mold and shape into virtually any figure you desire. Many fondant tools also work with gum paste. The major difference lies in the fact that gum paste dries much quicker, and harder, than fondant. Get a recipe for gum paste at Design Me a Cake for making the paste with Tylose. Cake-Decorating-Corner has a recipe for gum paste that includes unflavored gelatin, glucose and gum tragacanth. Gingerbread House Heaven offers a recipe that includes both liquid glucose and gum tragacanth. 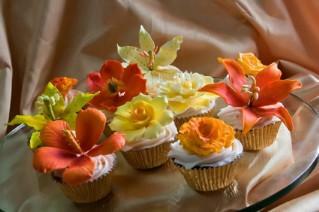 Cake Central online offers an entire category of recipes called Fondant/Gumpaste/Sugarpaste. Give the Easy Gumpaste Recipe a try, which utilizes gelatin and glucose. Cake decorating books, especially those that offer tips on professional cake decorating, often include one or two recipes for gum paste. Try these recipes, as the experts who wrote them often use them in their own cake decorating businesses. Gum paste pieces are often "glued" together using edible icings or mixtures. Try Wilton's gum paste adhesive recipe to make sure your gum paste objects stick together. Like other frostings and sugarcrafts, working with gum paste recipes is something that takes a little extra work. Following the directions, tinting and storing the gum paste properly all make a difference in the final quality of the gum paste. When making the recipes, it is important to follow directions carefully. Though ingredients might be similar from recipe to recipe, the directions are not necessarily the same. Some require a double boiler for heating the liquids and gelatin, while others require a stand mixer for incorporating ingredients. When making items out of gum paste, such as cherry blossoms, make sure you have the work surface dusted with cornstarch. Using a little shortening on your hands and fingers can also help keep the paste dough from becoming too stiff. If, for whatever reason, the dough is too sticky, try adding a little more sugar or cornstarch to the recipe. The point where food color or dye is added for tinting an entire batch also varies. Remember that if you want different colors of gum paste, you want to wait to tint until after the recipe is mixed. Then, knead color into separate portions of the gum paste, making sure to keep the rest of the mixture covered. Wear gloves to keep dye from hands.Dusting with powder or "painting" gum paste flowers usually happens after the gum paste figure has dried. This gives the flowers a more realistic look. Handle dried flowers and figures carefully, as delicate pieces are prone to breakage. If you want to work with multiple pieces of gum paste at the same time, perhaps for a larger project, cover each separate piece with either a lightly damp cloth or plastic wrap to keep it from drying out as you work. Store the rest of the unused gum paste in an airtight container until you need it.